I know exactly why you people hate to death these Boomerang clones. But believe it or not, I absolutely LOVE them! I'm giving a four and not a five for one reason and for the very same reason why you guys hate them so much. You guessed right. ROUGHNESS. The cobra roll is really hampered by the roughness and the loop is absoultely filled with vibrations entering and exiting it. A serious drawback because it requires you to ride in a severely defensive position, which is not an easy task since the trains are absolute bulls--t.
Try to hang on for dear life onto these horrible harnesses. Try to dispose your feet comfortably on this abominable floor. Try to find a seating position you're comfortable with on these sharpened stone-like seats. Try to observe the exterior of your car over these high as hell borders. That doesn't help us about the roughness problems, does it? But why a 4 and not a 3, or a 2... or a 1? It's AWESOME. You get two bone chilling, vertiginous ascensions, two unique, long, OMGWTF, exhilirating, shockingly amazing drops, one backwards and one front-wise, and 3 intense inversions done both forward and backward. Old, rough and uncomfy, but thrilling, unique, impressive and very satisfying. Not worth the wait if youve been on one before. The first drop was actually pretty good on this boomerang and sudden unlike on others, but the rest of the ride was rough. Also, the forces seemed weaker on this one when going backwards. Boomerang was a slightly above average boomerang, quite tall and fast. But the head rest was quite hard which made me want to put my head out which meant there was a little bit more head banging then on others I had been on. But the inversions were very tight and the coaster overall was quite fun especially going backwards. 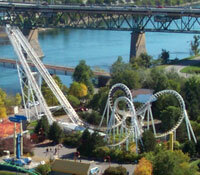 3rd best roller coaster at La Ronde. After Le Monstre and Le Vampire. OK if lines are not too long. Nothing like a nighttime Deja Vu at SFOG, but le boomerang is very intense and really leaves you stumbling at the end. Look out for the long lines though. This was my favorite coaster in the park. It was smooth and gave a pretty good ride. However, its a stereotypical Boomerang coaster and youve probably been on one better than this. Its a boomerang, and unfortunatley its the best steelie in the park. Pretty smooth as boomerangs go, but teh release is timed with the break drop in the station so you know when its going to drop Good warm up for Le Monstre. A slightly better than standard boomerang. Less head banging than most and a better station layout. The queue is in the middle of the caoster, so you have the train whizzing all around you while you wait. And the line can be 30 minutes for a Boomerang in Montreal.